Figs and hazelnuts: hazelnut sablé, white cheese sorbet, fig confit, fig cream, dipping ravioli, fig purée. He comes from a family of boulangers from Epinal, France, but he decided to go for pastry. 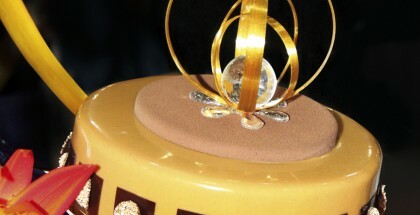 At only 21 years old and under the tutelage of Philippe Tort (Pâtisserie du Musée, of Epinal), Nicolas Lambert became the youngest winner of the National Festival des Croquembouches. 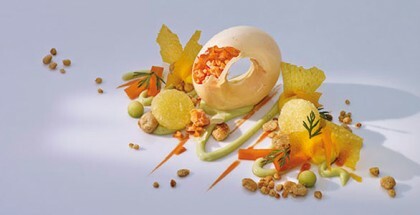 He continues his career alongside great masters such as Sébastien Bouillet of Lyon, Christophe Michalak at the Hôtel Plaza Athénée (Paris), and Jérôme de Oliveira at Intuitions. In 2015 he started working under the orders of the chef Fabrice Vulin of the restaurant Caprice at the Four Seasons hotel in Hong Kong. The French restaurant is classic and inspired by seasonal products. 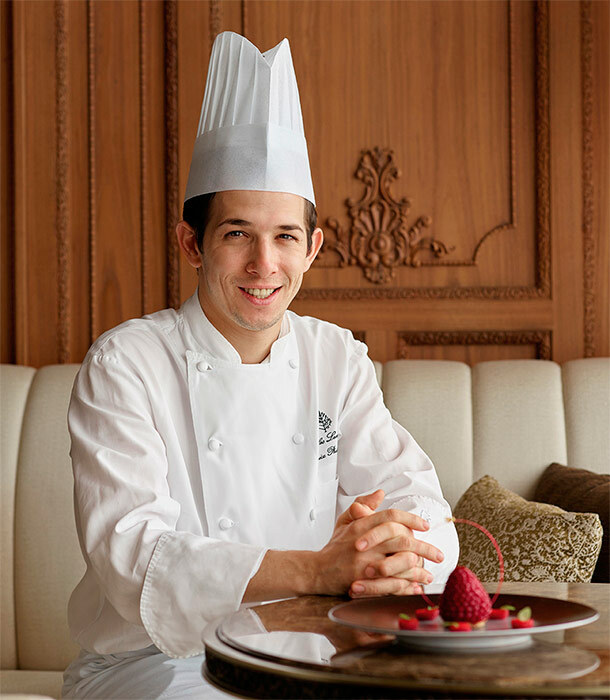 The desserts are aligned with Vulin’s guidelines and, as head of the dessert station, Lambert is also responsible for a wide assortment of petit fours and anniversary cakes. ‘I try to teach my pastry chefs that if they have done a good job they deserve to be praised, but if something has not reached my standard of quality I also show them the correct way to learn and be better. It is necessary constructive criticism,’ he adds. The sweet menu is very varied, but what is never missing are soufflés, rum babas, desserts based entirely on seasonal products, a chocolate dessert, and a house dessert in the shape of a raspberry, which in winter becomes a blackberry. At Caprice, he enjoys the creative freedom he did not have in the past, when he worked in shops where creations had to stick to packaging and a longer commercial life. The immediacy of consuming a restaurant dessert allows him to experiment with softer textures, ice cream, and sugar decorations. When faced with a new creation, he reasons, first seeking the correct balance of flavors through three textures: crispy, creamy, and the presence of the texture of jam or fruit confit, like in the figs and hazelnuts dessert. However, if the arrangement of the elements on the plate is not adequate, it will not achieve the desired effect in this game of textures. The second step is, then, to study the visual design of the dessert. Mix everything together and then roll to 3 mm. Cut with a cutter to 4.5 cm long and bake at 150ºC for 12 minutes. Boil the water, glucose, pectagel rose and sugar. Add all the other ingredients and mix. Churn in a Pacojet and then place inside the silicone mold. Boil the first cream, sugar, honey and gelatin mass. Add the fig slices (thinly cut) and infuse for 20 minutes. Strain over the cold cream and the mascarpone. Mix everything together. Fill a silicone dome mold (4.5 cm in diameter). Start by cutting the fresh figs and placing them inside a 7-cm-wide ring. Place inside one hazelnut sable of 4.5 cm. Add some fig confit and place 6 toasted hazelnuts on the top of the confit. Then place inside one scoop of white cheese sorbet and finish by closing with the fig cream. Dip the ravioli in the dipping ravioli sauce and place the ravioli (fig purée sphere) directly on the top of the dessert. Add some dry figs, toasted hazelnut and fresh hazelnuts for the decoration. Take out the ring and place 3 purple sugar sticks. For this dessert, it is better to use figs from Solliès and hazelnuts from Piedmont.